Fan, Day 14: Nuno Gomes (unabashed fangirl post) | Have you heard that it was good to gain the day? « Fan: Day 13 – Once. Nuno Miguel Soares Pereira Ribeiro, born July 5, 1976. The fans know and love him as the one and only Nuno Gomes. He played for Portugal in U16, 17, 20, and 21s, as well as for the national team starting in 1996. Professionally, he started in 1994 in Boavista at age 18. Ironically, his first ever trophy came in 1997 as Boavista beat his future team, Sport Lisboa e Benfica. He then transferred in 1997 to Benfica, where he played for 3 years. Because of Euro 2000 (and the way Portugal football is) he made the transfer to ACF Fiorentina. In 2002, due to money issues in Italy, he found himself back home, in Lisbon, at the Estádio da Luz. He’s been plagued by injuries throughout his career, but he’s still been a key player for Benfica. He was made team captain over Rui Costa in the 2006-2007 season, and every time he took the pitch, he had the armband. He was the Seleccao captain for 2007-2008, eventually succeeded by Cristiano Ronaldo. When Benfica started signing strikers left and right, he eventually lost a starting position and was put back on reserves for the last 2010-11 season. It’s been evident for many fans that the writing was on the wall for him, but I was hoping just one more year. Unfortunately that has not come to pass. The man played 52 minutes in 5 games this year and scored FOUR goals. “Today, I was informed definitively that Benfica have decided not to renew my contract. It’s a technical option that I respect, and I will always respect, whether or not I agree with it. From this moment onwards I am free to analyse proposals and to choose my future. We won’t even get into how sad I am that Benfica has decided to move this way. They are obviously out of touch with their fans this transfer season – from my standpoint…. There is someone in higher than pitch level that does not want to see Nuno end his playing career at Benfica. The only solace I have is knowing whatever club picks him up, he should get more playtime than he had last year. And whatever team picks him up, I’ll be watching. FPF Vice President had some nice things to say about him in this article. He is now being linked with EVERYONE: MLS (Toronto, San Jose, Revolution)…. Italy… Germany… but my bet’s on him staying in Portugal. Braga is sniffing heavily. He’s stated he does not want to play for anyone but Boavista and Benfica in Portugal, but since Benfica is out … who knows? If he wants to make Euro 2012 he needs to be put on the pitch, often, and allowed his chance to shine yet again. And I hope that will happen. And I’ll be watching. The man is perfection in a uniform. He is without a doubt the one footballer I want to meet and thank for being such an inspiration to so many people. 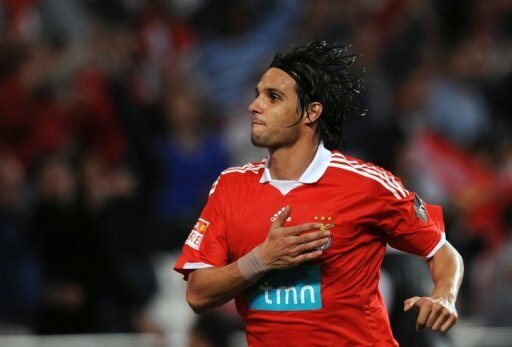 If you ask my favorite footballers, next to Eusébio, it’s probably Nuno Gomes. After coming back from knee surgery that effectively took him out of any Europa League play (and, arguably, had a definite impact on Benfica as well in the tournament), to see him put on the armband and take the field for his (as it’s come to pass) final Benfica match, I was quite literally crying when I watched this. Some amazing video of the man and the legend, forever in my heart, forever my Captain, your faves could, would and will never: Nuno Gomes. And come on, who else would have a video dedicated to him by Nani himself? There’s a 45 minute video floating around the internet of a television show he did. It’s hysterical, awesome, and the outtakes will make you cry with laughter. I’ll find it. Click here to be reminded by mail about me! Have a heart attack, PR!